This looks like Adeptus Tianicus the movie. I like where this is going. This is really great work. It’s quite a unique style and I like it a lot. They look like they’ve walked out of a painting. Edited by Sherrypie, 09 April 2019 - 10:10 AM. In view of how you worded it, I'm tempted to answer with a resounding "No" Only the ones with iron resolve can! The smoke and trees are brilliant - really atmospheric! 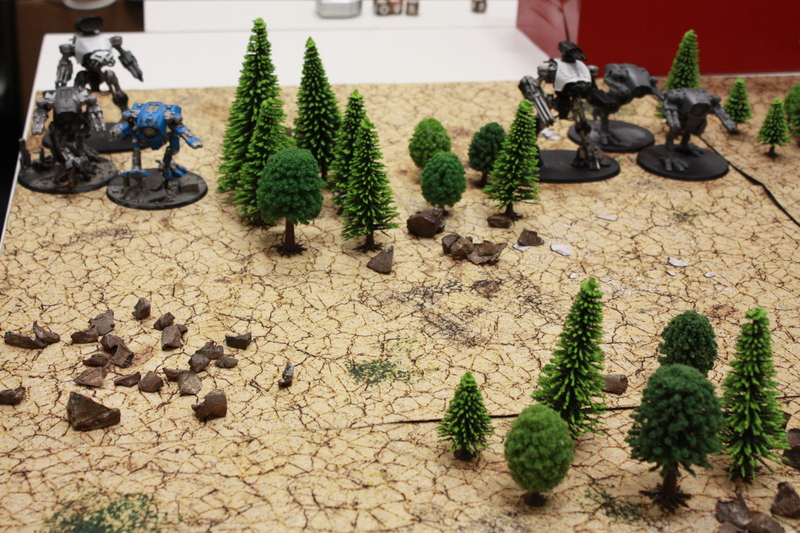 ... which might then actualize in yet more stuff to clutter one's boards with, though these are mostly for 40k purposes. 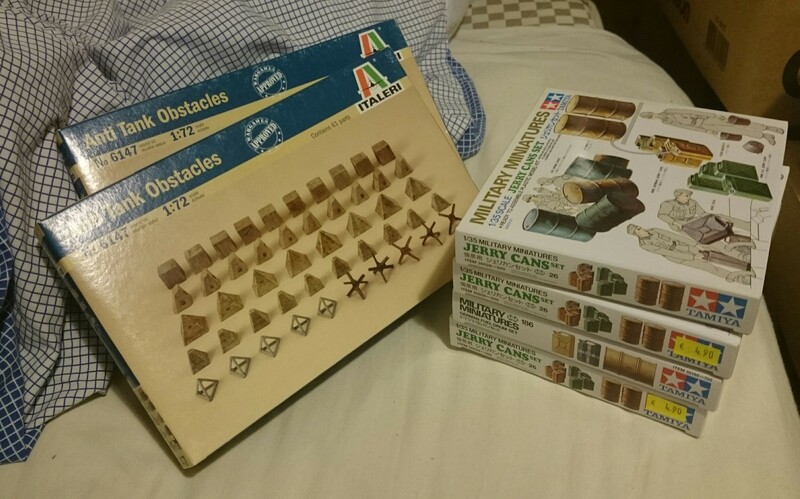 Still, those heaps of dragon's teeth could very well double as some massive earthworks and barriers in AT / Epic efforts, given the huge scale of 40k constructions. 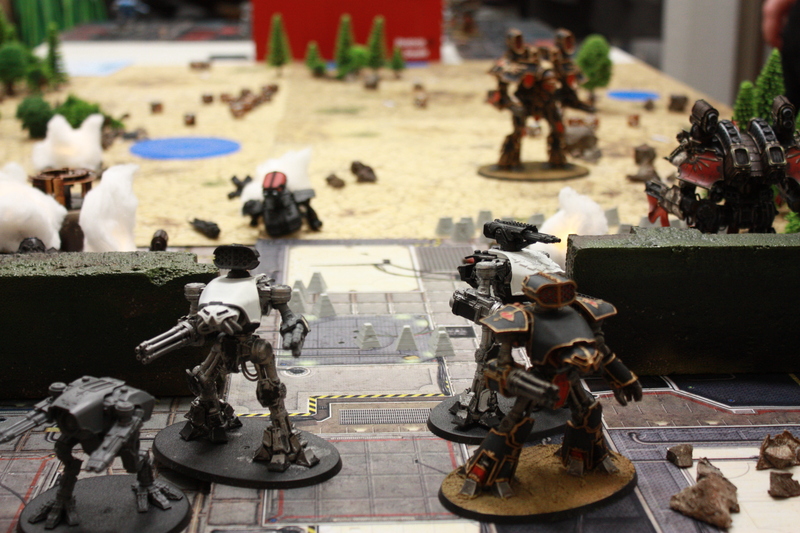 The allegiances of Collegia Titanicus are fickle at best and as it happens, before any clear lines had been drawn at the dawn of the Heresy, a battlegroup of Mortis and Astorum marched side to side against a bastion world of Legio Favilla's benefactors. The conflict was inevitable and at the gates of their mightiest forges, the Ashen Gods stood vigil for the moment their opposition would break through the conventional defences. Time to try some narrative scenarios, this time The Second Battle of Nyrcon City! 2000 points of Legio Favilla in a Regia maniple (+ a plucky Reaver in support, using Krytos rules) are ready to take on the combined might of a 1500 point Axiom of Mortis and two 750 p Astorum Venators. There's some proxying involved in the weapons (all heavier Mortis engines have one fist, Favilla's Warlords have a Quake and a Plasma complementing their Belicosas, Mortis' Warlord has plasma and Turbolasers...) and sadly not everything has been painted (least of all the tank traps I just got the day before ) buuuut... screw that, they'll get done eventually. Gaming time! There is a precious moment of calm before the explosive violence about to unfold. The Favilla's Regia hunkers in position around their Lords. 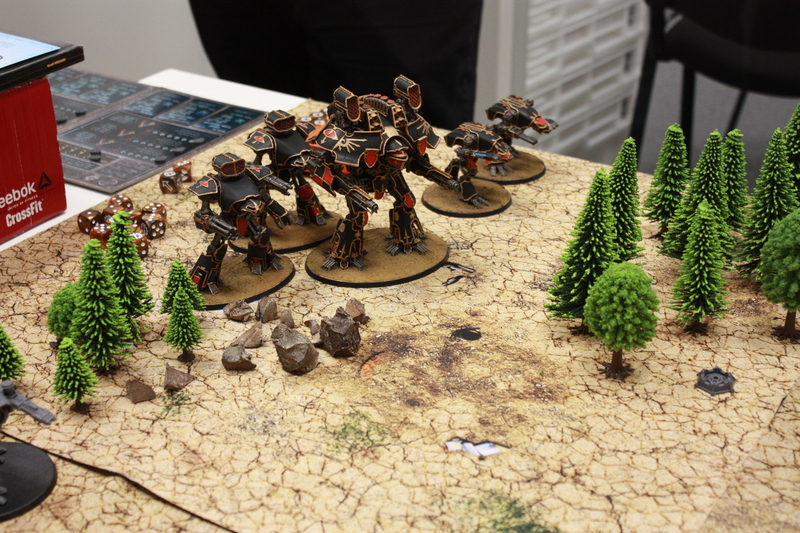 Astorum's hunting packs stalk around the left flank. 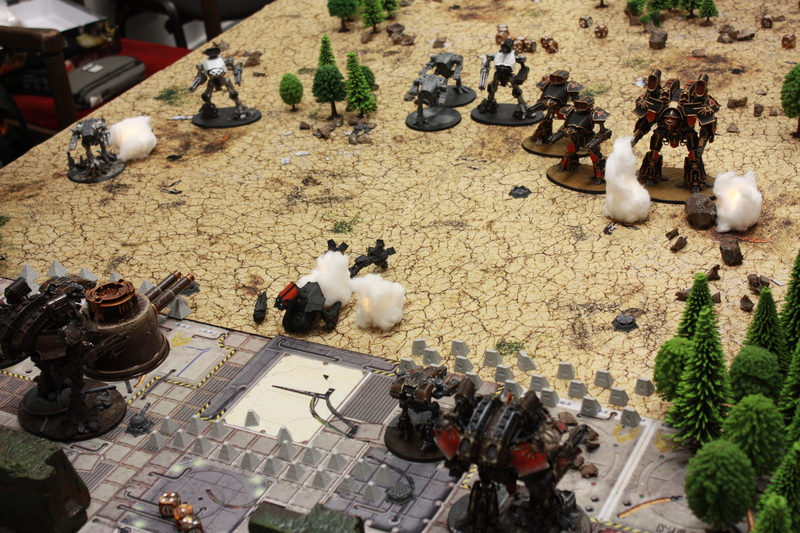 The battle is joined as the first artillery barrages rip shields off the center 'Hounds and the defending titans switch to First Fire orders. 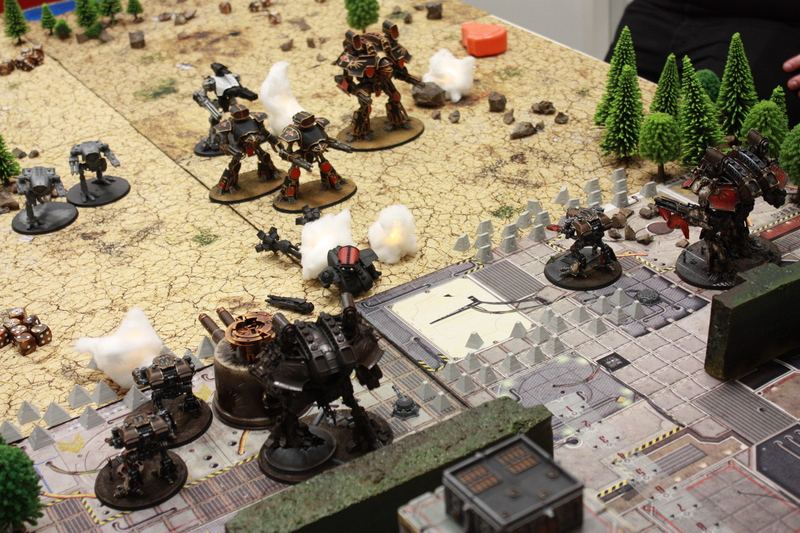 The melta Reaver attempts to dodge out of their way, which leaves the Warhounds behind to take fire and falter in their steps as Aurora Terribilis, the Reaver at the gates, unloads Earthbreaker missiles under them and cuts their movement in half. 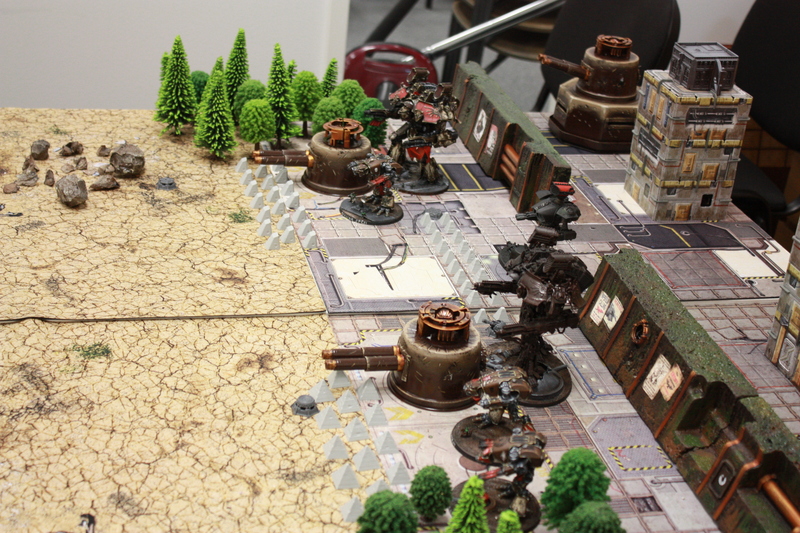 Their firepower gets pretty much neutered for the rest of the game, too, as their plasmas are blasted offline refuse to get back up any time soon. 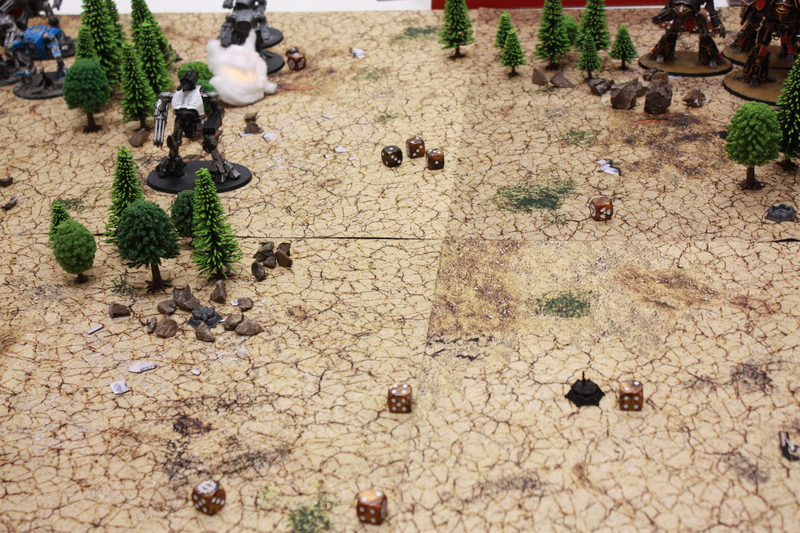 The intrepid heroes of little infantry strongpoints fiddle with their panzerfausts as the first explosions shake the ground. 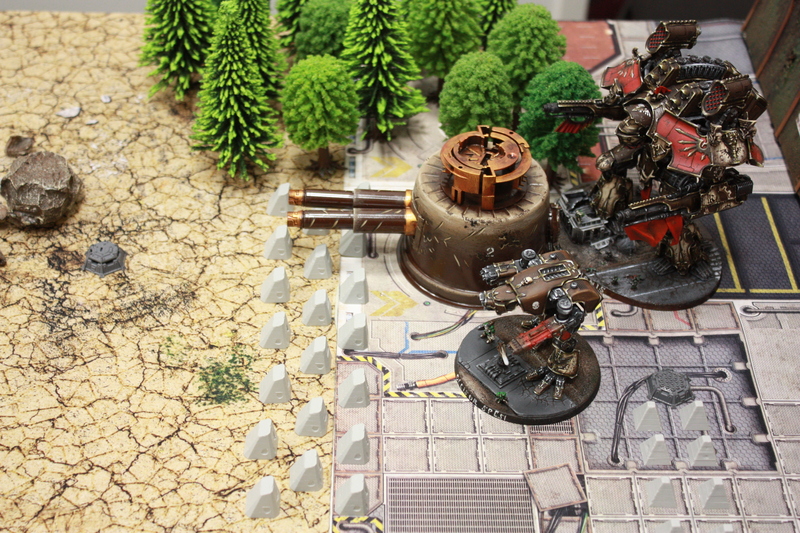 The Mortis maniple crashes heedlessly through the woods on the right flank, crushing both trees and one outpost under their iron stride. As the invaders' line closes the gap, most weapons get in range and explosions fill the air as shields flash and flicker. 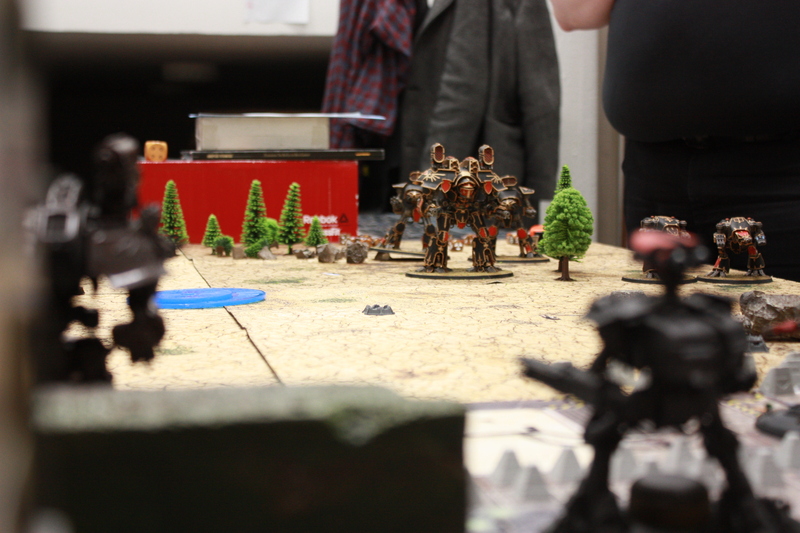 The closest Warhounds don't have time to dodge and face the full fury of Iudex Ultionis, Favilla's commanding Warlord. 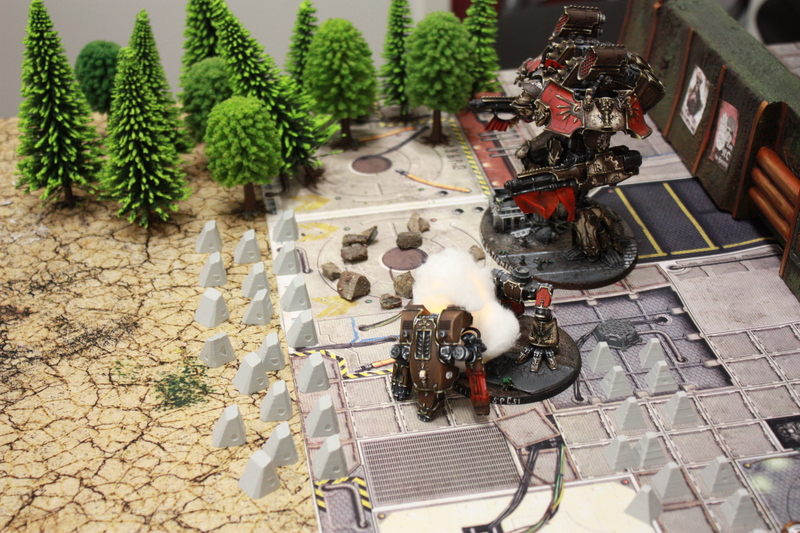 A hail of missiles bursts their shields, Belicosa rips through them and a well placed Quake shot punts them backwards, one bashing against the Reaver behind it with destructive force. Seeing that the Regia groups are holding pretty well under the fire, Aurora Terribilis makes a foolishly brave attempt to run forwards and use its melta against the Warlord in front, but in a display of operational friction realizes this isn't actually supported by other engines on that flank and finds itself the target of a whole bunch of battle titans. … Which goes about as well as can be imagined. 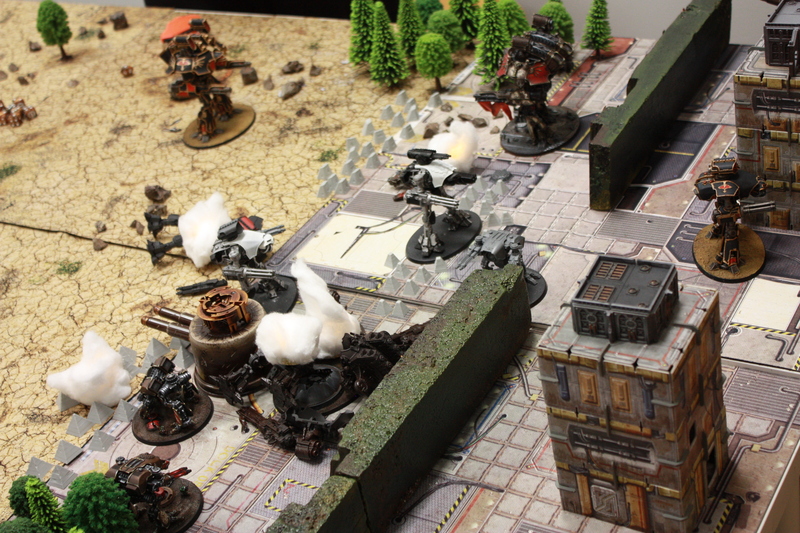 At the same time, Favilla's Warhounds credit themselves well and take down two of their kind from the opposing lines. Bunkers and battlements finally start to fall, exposing the right flank to the continued pressure of the approaching battle line. 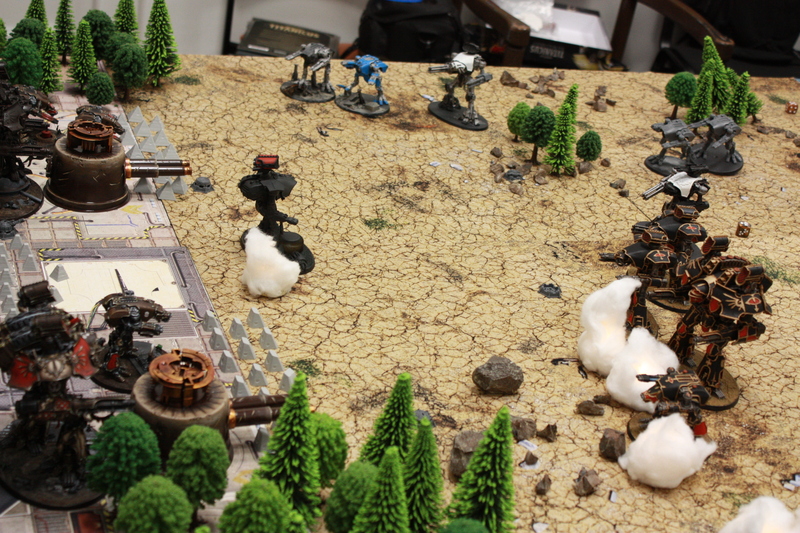 The surviving lead Hound at the left flank is burning its reactor at red and is so damaged it will blow up from any damage in the Damage Control, so it runs against the defence lines in hopes of exploding, but mainly sputters down in embarrasment and rolls two Superficial damage results against Edax Rerum. As tensions rise, Occisor Spesi takes down the Reaver at the front but is likewise finally cut down as both Warlords are running quite hot and Iudex has to maintain some shields on itself. Bunkers fall, trees splinter and dogs get kicked around. Disaster strikes on turn 5! 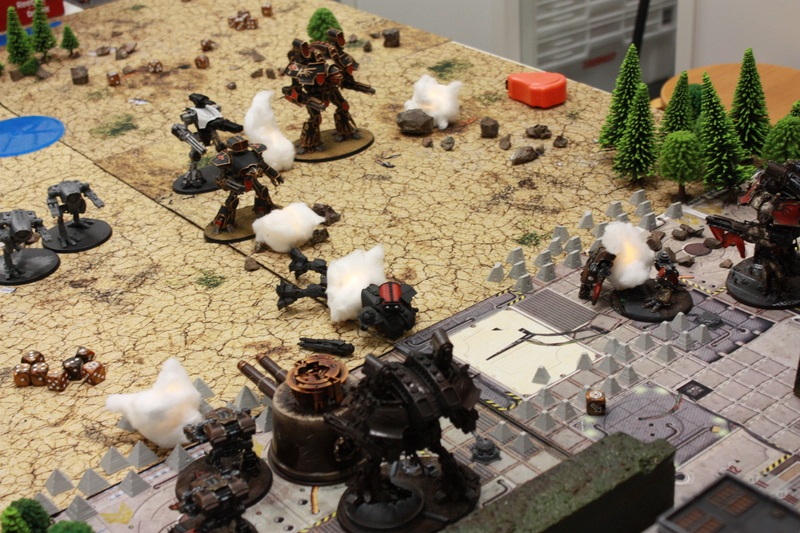 Memento Mori, otherwise untouched but running hot from firing Belicosas and Sunfuries all day long, decides to take a 1/30 risk to both roll two heats and then an explosive result in Damage Control to get more shots out before being overrun and BOOOM it goes, taking with it some macro-cannons, infantry and poor Edax Rerum, who gets shaken to dead silence. From a reasonably comfortable position we enter a nailbiting endgame, as by this point both Iudex Ultionis and the last Warhound Echo Dolorum are next to immobilised and a pile of Reavers are surging through the gate under a protective cover of smoke barrage. While the battered and bleeding Warlords are exchanging fire on the right, artillery fire is falling down everywhere. 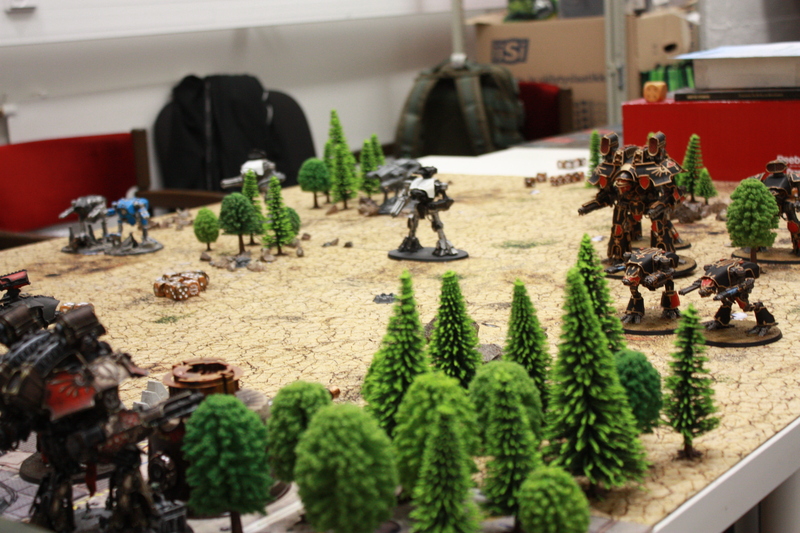 Echo Dolorum manages to get its legs working and backs towards the woods to get some final shots in without dying in the process, in vein as the last limping Warhound evades its fire by dashing into the city proper. 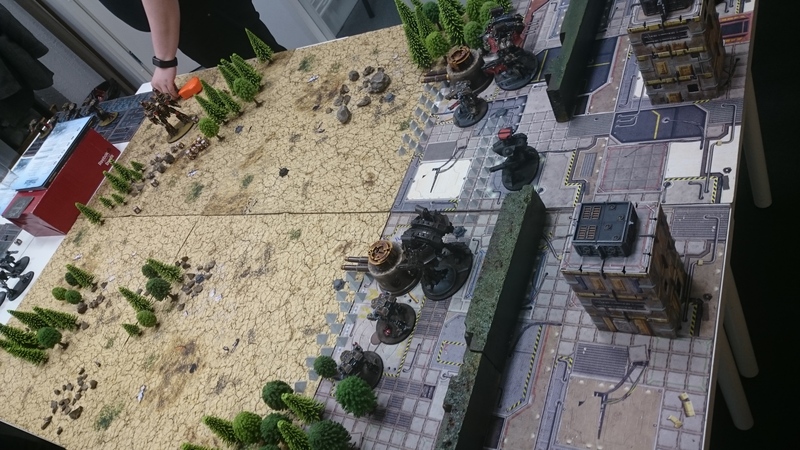 As the seventh and final turn draws to its close, the attackers finally barely breach the gate and manage to down one building, ripping it apart with power fists, while the melta/laser Reaver manages to roll three twos and miss all relevant shots to demolish another. In the end, the deciding factor comes down to the Mortis Warlord (which had been in a Quake lockdown for half of the game in its duel with Iudex, occasionally even blasted backwards because of the Mori Cannon) having been too slow and the defender manages to eke out a pyrrhic victory of 48-32 points, with two engines standing on almost entirely blownout legs. The attacker lost five Hounds and a Reaver, but is now in an untenable position and will be driven out of the city. 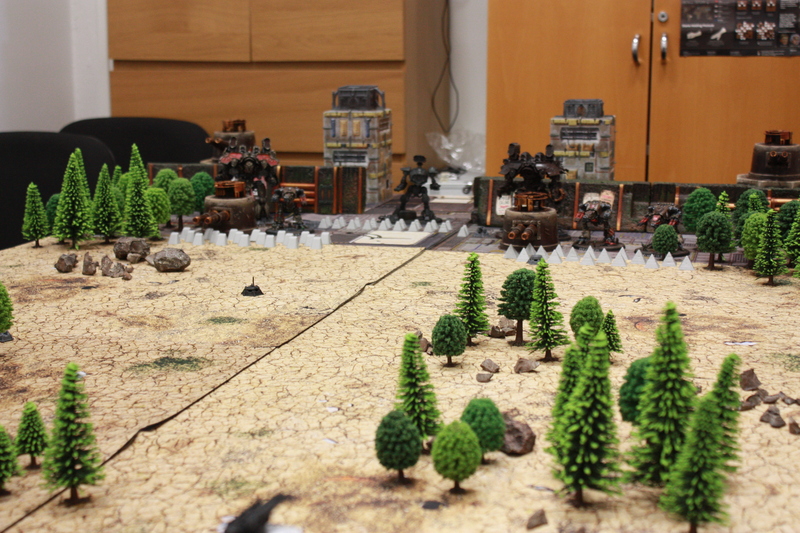 Cool battle report, seems it was good fun, the tea lights are a great idea. The battle report is really great. I've just spent half an hour reading through the very cool series of project threads on here but yours is the most inspiring I've found so far. More please! Thanks lads, that's nice to hear! Very very cool mini Titans Brother, keep up the sharing. some players paint more than others eh? I'm slow as molasses and get stuck on little details like fiddling with possible transfers for days, my Mortis pal went for a quick and effective scheme to just get things ready for table top baseline and the fella playing Astorum wanted to try out some just started Warhounds, so eeh. He's not the keenest on intensive painting anyway, but I feel this Titanicus project might be a nice incentive for him. I'm confident the reports will eventually start to look much prettier, as every titan and piece of scenery done contributes to the forces present in a meaningful way. One engine is often like what, 16-20 % of the army? Best way to speed up things would be skipping highlights and drybrushing the metal skeleton. 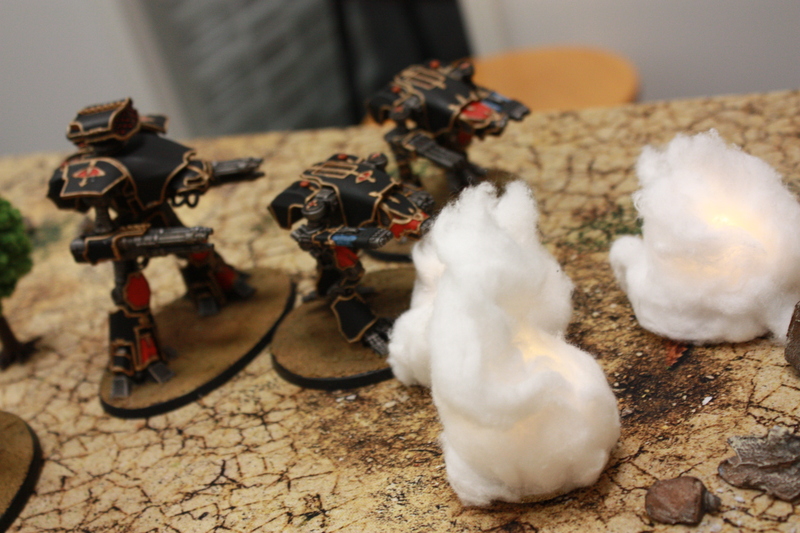 Also: FEAR the headless warhound!